Some time ago… OK exactly one year ago on November 30th last year!… Gerry and I had arranged a sunrise shoot at Freshwater tidal pool. 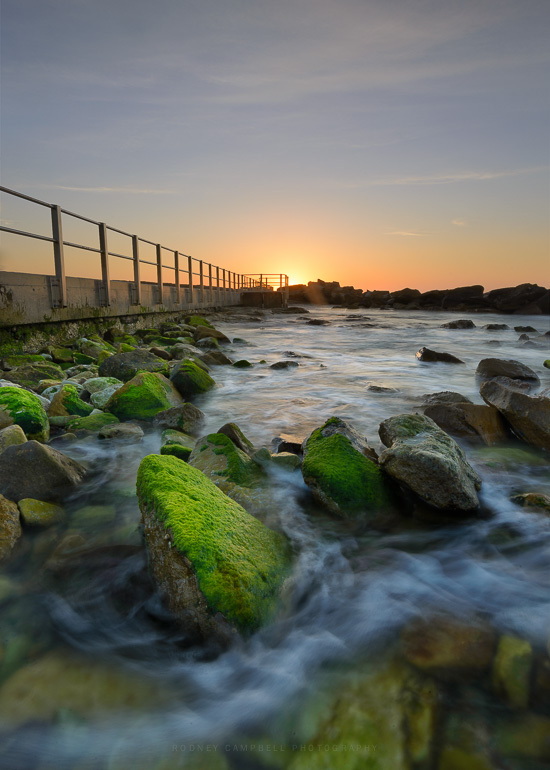 Freshwater is one of Sydney’s northern beaches – it’s just north of famous Manly beach and the tidal pool is on the rocks at the northern end of Freshwater beach. 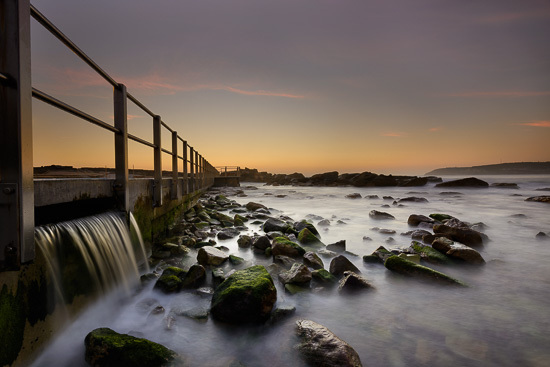 Gerry was keen to shoot this location on this particular day because the sun would rise directly in line with the side of the pool. About twenty minutes to sunrise the pool lights went out and I figured I’d climb over the railing down into the ocean beside the pool and try my luck there. Sometimes you just have to get wet to get a half decent composition or subject. 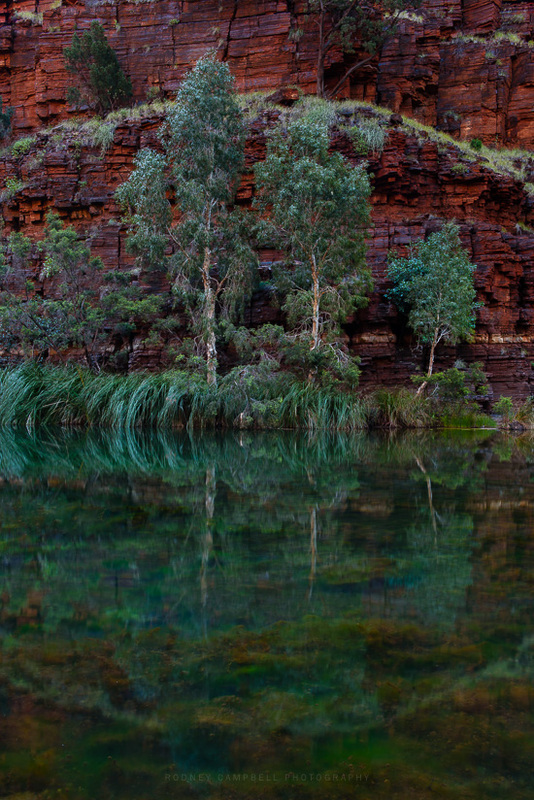 Here I’m wading around at around knee deep in water over precarious slippery looking rocks. Thankfully in this more sheltered part of the bay the waves are very small so no chance of being swamped. Facing along the side of the pool towards where the sun would soon rise (ten minutes to go). 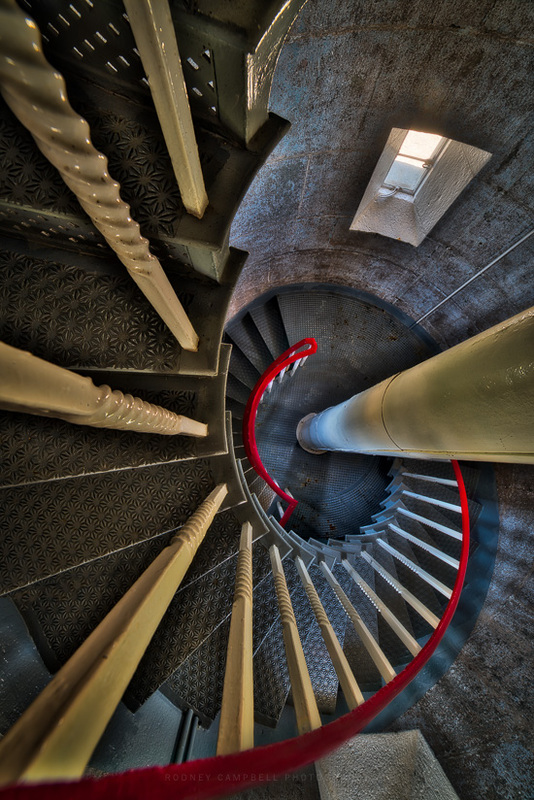 This is a manual layer blend of three exposures in photoshop. We were just starting to get tiny touches of high whispy cloud which was hinting pinks tho the colour really didn’t last very long and the clouds weren’t coming in fast enough. Just after sunrise I’m swivelling to my right since the clouds were coming in from over there and frankly it was looking more promising. Plus there were all these very fab nuclear green mossy rocks strewn about near this outflow from the pool. Hmmm “outflow”, nuclear green, coincidence?… lets not go there…. Unfortunately at the eastern seaside end of the pool there’s a large stretch of rock reaching into Queenscliff Bay which encompasses Freshwater Beach. This blocks a view out to sea from this low angle and also the chance for a nice clean horizon line. It was a couple minutes after sunrise before the sun actually started breaching this wall of rock. Time to swivel back around and down the length of the pool wall. 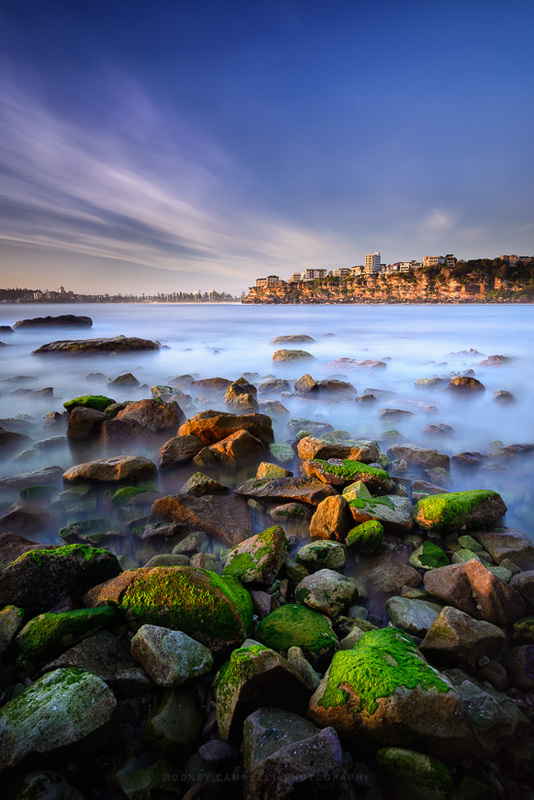 This is another manual layer blend of four images – essentially one underexposed for the sky and three similar exposures for various parts of the foreground with different water movement and visibility. 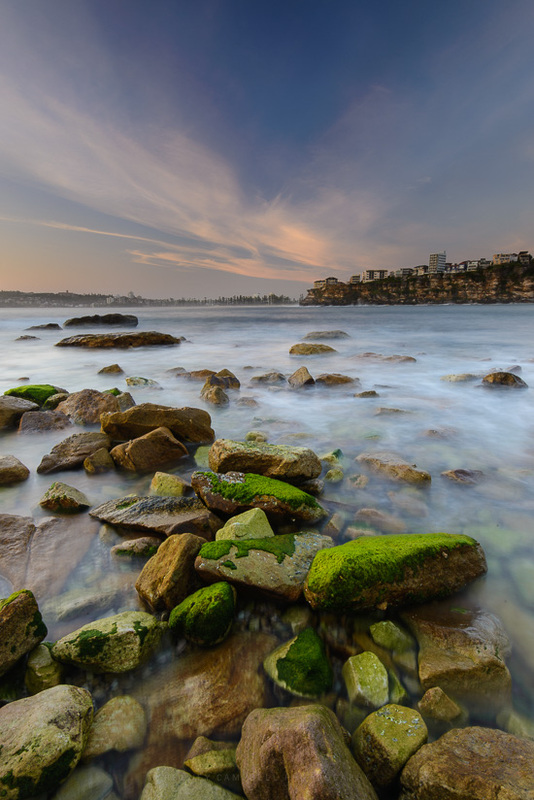 The view over some more nicely placed green rocks across the bay towards Queenscliff head and Manly beach just to it’s left in the middle. Afterwards I took a walk along the coast to Freshwater Beach itself to recce the area for potential future shoots (there’s these twin outflow popes there which showed potential on Google Maps). 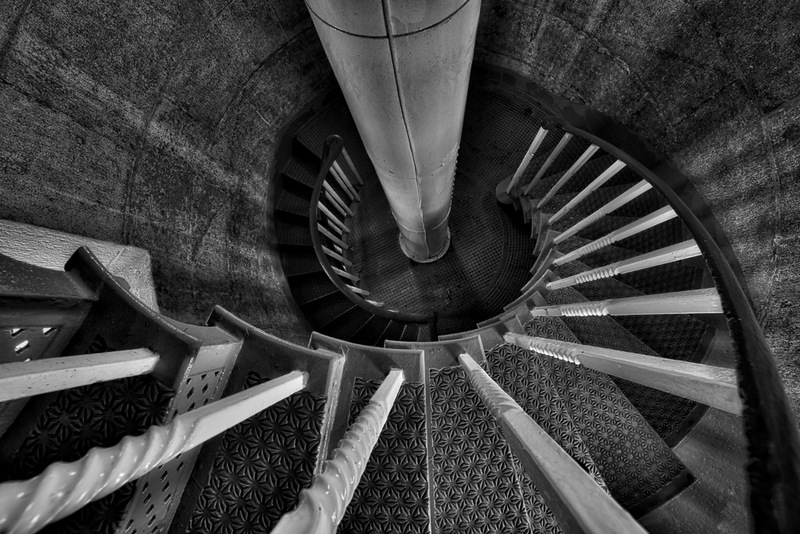 However uninspired I took one shot with the BigStopper and was done. My daughter and I now needed to make our way out of Dales Gorge before it got dark. The climb out would be near impossible in the dark and we had to go the long way to get out. It was still light now but we were still possibly an hour a way from getting out and it was almost 5PM already with sunset at 5:38PM today. With the sun now quite low and just hitting the top parts of these deep cavernous gorge walls with a softening light the colours of both the real and these impossible reflections were magical. How could I not linger and take a few more photographs before leaving :). The above image is a blend of four images on layers in Photoshop. I’ve used different frames for blending both exposure differences (the very bright and dark areas of the frame) and also for focus stacking reasons. 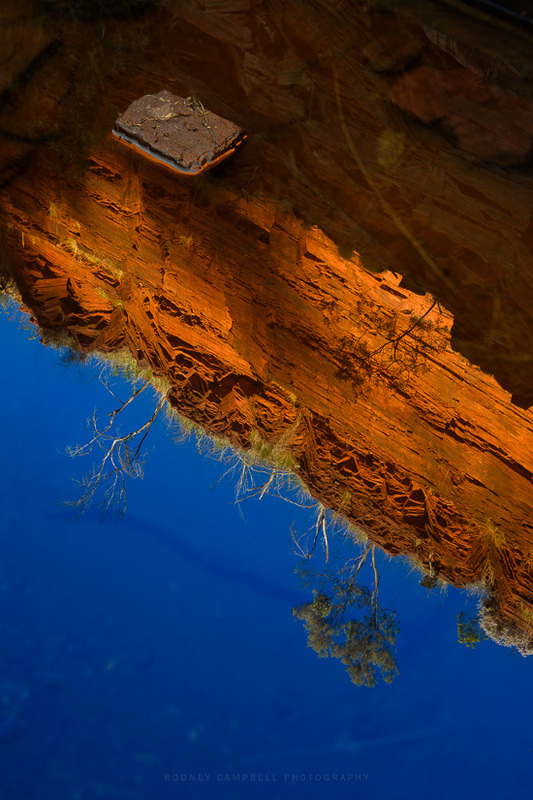 This somewhat confusing image is taken looking down into the still water and showing the reflection of the sky and gorge walls above. However that small rectangle rock in the upper left quadrant is in the water itself and thus at a vastly different focal plane to the rest of the image. More beautiful colours and reflections in the very late afternoon light being reflected quietly down into the base of the gorge. After 5PM now and we really must get a wriggle on – we still have to make it back to the steps going up and make that painstaking climb out of the gorge. I think we made it to the top just a bit after sunset – phew – and only half an hour or so late :). 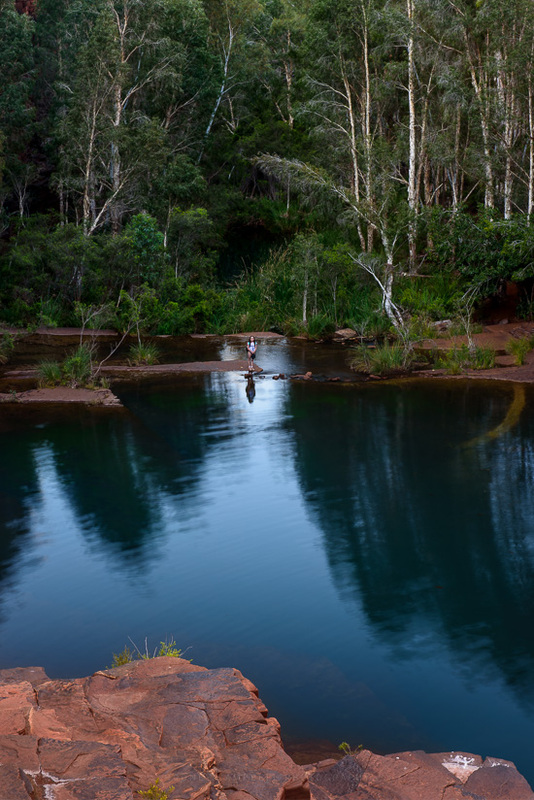 Not far (perhaps only 200m) upstream from Fortescue Falls is the beautiful Fern Pool. 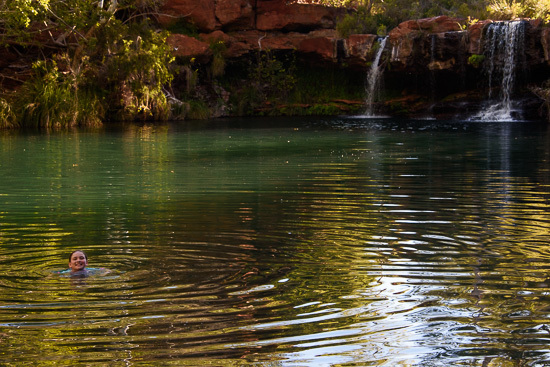 Here you can have a refreshing swim in the spring fed permanent falls. You feel like you’re in a tropical paradise at this pool surrounded by ferns and trees. Park managers have erected a wooden swimming platform with stairs, so water access is easy. It was now almost 4PM and my daughter and I changed into our swimmers and took a dip in those very inviting – but VERY cold – waters. 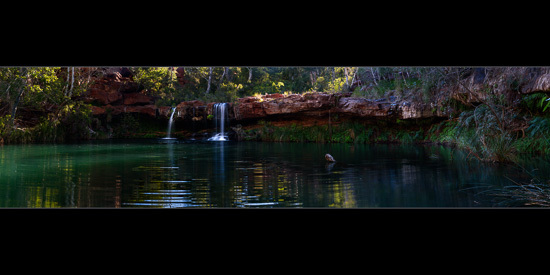 This is a stitched panorama of nine (9) vertical frames taken at a tight 105mm. Because of the very strong contrast in the scene – parts were in full sunlight and parts in full shade – I shot HDR brackets for each of the panorama frames. In the end I have nine sets of five (5) bracketed frames taken at 1EV intervals from -2 and 2/3EV to +1 and 1/3EV. I then processed each of the sets of five frames into a single 32bit image using Lightroom’s Photo Merge to HDR feature. I didn’t post process any of those frames but then stitched those nine HDR frames into a panorama again using Lightroom’s Photo Merge to Panorama feature. I then processed the final 32bit DNG in Lightroom. The end result would definitely have been better had I shot it at a better time of day (when the whole area was under open shade – for example near sunrise/sunset/twilight). I’m still happy with this result and it gives a pretty accurate representation of what it was like. How lush and green and inviting it was. 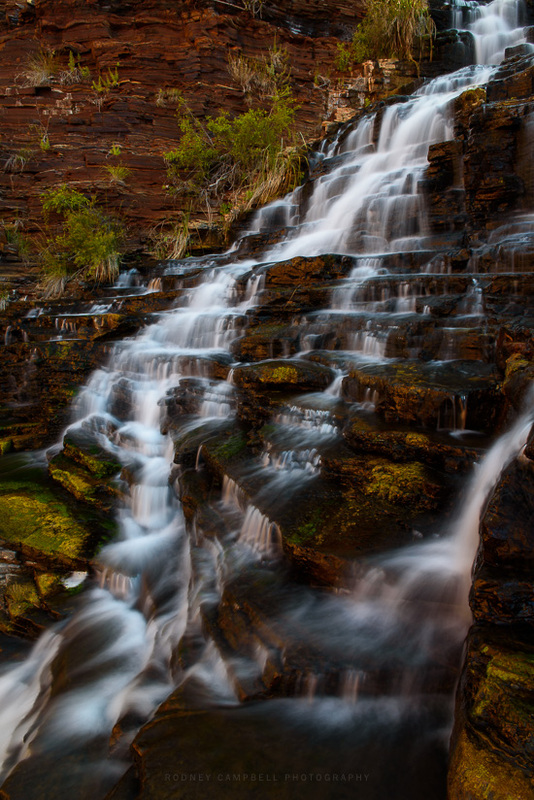 After winding our way along the base of the gorge we eventually made it to the base of Fortescue Falls. Thankfully the majority of the falls themselves were in shade by the time we arrived there (3:20PM). This made it much easier to get some nice shots of the water flow in the falls. Here is a smaller section around the middle of the falls. 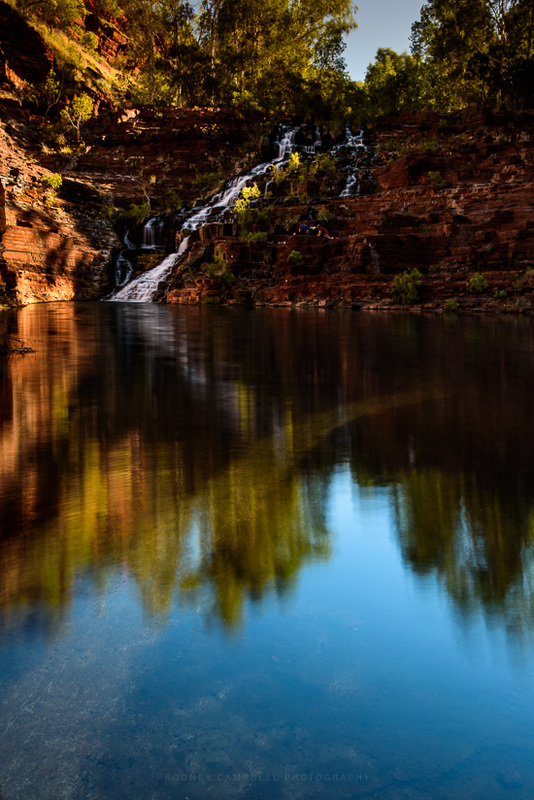 This oasis in the middle of the remote and unforgiving region of the Pilbara is beautiful and tranquil with it’s deep green waters surrounded by lush green vegetation and red rock walls. The waterfall actually flows year round so even here during the dry season it’s a fantastic spot for a refreshing swim. There were visitors everywhere on the falls so getting a shot of the falls without people swimming, lounging or walking on the rocks wasn’t likely. With so many people around I opted to move on fairly quickly. Thinking we might get a chance to get back here at a later stage and spend some serious time exploring the area to take some photos. Silly me :). This is the view (on our way back out) looking from the top of Fortescue Falls back down the gorge towards all those fantastic paperbark trees at the base of the gorge. That’s my daughter waiting patiently down below (form me to both take the photo and then climb down there to join her :)). We headed further upstream towards Fern Pool and our destination for a swim on this hot afternoon.